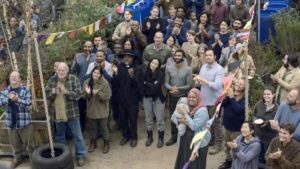 The penultimate episode of The Walking Dead season nine was a gruesome return to form as the Whisperers slaughtered ten people to mark their territory and to send a bloody message to the united communities. 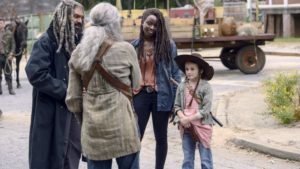 The Walking Dead usually reserves its character deaths for mid-season or season finales, a pattern that has lessened the impact of these deaths because of their predictability. That’s what made this episode so powerful. The deaths happened here and now we wonder what the finale is going to offer and that’s how the show can keep us on our toes. After last week’s horrors, I didn’t expect that the show would deliver on more gruesomeness but my expectations were exceeded. The Walking Dead finally learned from the mistakes of its sixth season where, after building up to Negan’s arrival all season, Negan does kill someone but audiences were left with this terrible cliffhanger where we needed to wait till the seventh season to learn who had been killed. This caused no end of frustration and even pushed viewers away from the show. 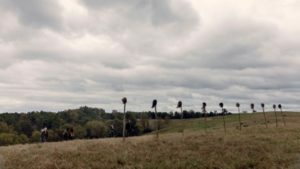 Thankfully, this episode spared us that mistake and the identities of the Whisperers’ victims were revealed with just the right amount of drama and impact. One reviewer went so far as calling this the “Red Wedding” moment of The Walking Dead. Granted, it has been obvious throughout the season that the something terrible was going to happen at the inter-community trade fair. That much was expected and the more the episode showed people being happy together, the greater the sense of foreboding. Happiness is a luxury one cannot afford in the world of the zombie apocalypse, a perspective Alpha and the Whisperers clearly subscribe to. The more things seemed to work out between the once-fraught groups, the more anxious I became. Much of the episode became a game of guessing who would be struck down. Every minor character who was suddenly being given a touching moment or some significant screen time was a potential target. How many would fall and who would fall were the questions of the episode. The writers tried to lull us into some false sense of security by showing how successful the trade fair was going. Michonne, and by extension, Alexandria, arrived and reconciled with the other leaders. Families were reunited, friendships re-forged. Lydia was accepted into the community’s protection. There was even a symbolic signing of the charter that Ezekiel had been saving for this moment. There was plenty of food and fun. Eugene was in dunk tank. Luke and Alden were going to sing. Everything was going just as planned. But of course, none of this was meant to last. As soon as we saw Alpha, all cleaned up and wearing the hair of a poor woman she just scalped, we knew that trouble was already at the door. The episode played around with time to try and subvert our expectations, flashing between happy scenes of the fair with the reveal of every head on the pike. I feared for everyone. 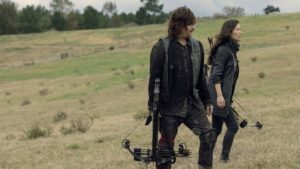 In the comics, the biggest victims were Ezekiel and Rosita, and given the scenes they had in this episode, I worried for them as well when the pikes were being shown one-by-one. Henry’s death was saved for last and though I shed no tears to see him go considering how annoying he has been for his whole stint on The Walking Dead, it’s really more of the impact this will have on the people who love him. It was especially gut-wrenching to watch Daryl shout “No!” while trying to shield Carol from the view she could never avoid. After opening her heart years after losing Sophia, Carol has lost another child. Henry’s loss will also be terrible for Ezekiel, Daryl, and even Lydia, who surprisingly survived and is on the path to redeeming herself. 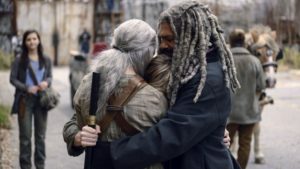 The episode ends on a strangely hopeful note, not with the reveal of all who were killed but with Siddiq delivering a story to inspire the communities to band together in the midst of their grief, to stay united in the face of evil, and to continue to protect each other against their new enemies. The last scenes lessened the sting a bit so that we the viewers would not be left plunged in despair.